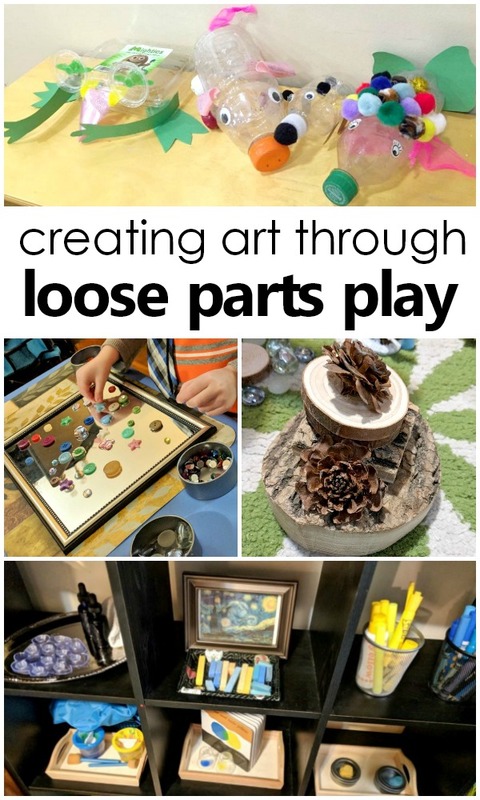 Art and loose parts play open up a whole set of learning and play experiences for little learners. What is art? Many people have different ideas about what constitutes art, but most probably envision a process that is a means to an end–hopefully a masterpiece! Art with young children is often divided into two categories: “projects” and “process art.” There are benefits to both. Projects encourage following directions, spacial awareness, fine motor development, problem solving skills and more. Process art encourages many of these skills while fostering independence and creativity. One of the first things I noticed when introducing children to loose parts was how artistic they seemed at play! Children have a keen eye for aesthetics. Given the time, space and opportunity to explore loose parts, they naturally lean toward intentional and meaningful creations. I am so excited to be back today to introduce some ideas on encouraging art with loose parts. What will I need for art and loose parts play? 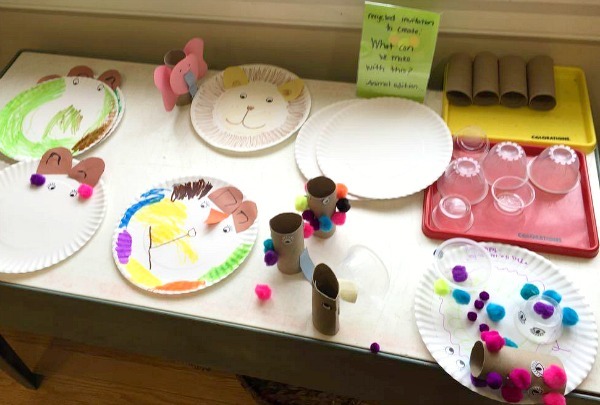 Art materials and loose parts can mingle in all kinds of creative and exciting ways. One of my favorite places to find great treasures for art with loose parts is the recycling bin! When it comes to art materials in general, I love to use the “real thing” whenever possible. Children have an inherent respect for “grown up” art supplies and can treat them with great care. A few high quality art supplies are often better than a large amount of lower quality ones. And you can use a bit of both! High quality does not need to be expensive. Thrift stores can be a great resource! Some children are keen to spend hours mass producing artwork almost like an assembly line. Others spend a good long while on one piece. Still others may be less drawn to drawing and leave the scene after a quick scribble. There are those who fill a page and those who are minimalists. Art with loose parts meets all of those needs and introduces mediums to artists of all kinds that will inspire and provoke creative thinking. I love to have a child accessible art area stocked with a variety of supplies and loose parts. I rotate items in and out as needed. If this is not practical for your space, you can set out materials as you’re ready to use them. 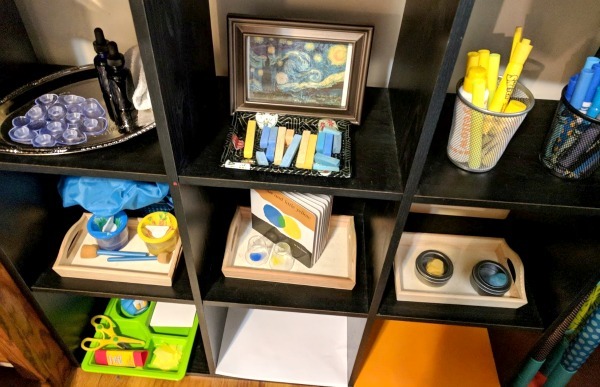 When I set up an art activity with loose parts, I may simply set out a sectioned tray with a few small materials and a frame, mat, paper or mirror as a work space. Your small materials can be flat like scraps of tissue paper or fabric or more three dimensional like mosaic tiles or glass stones. 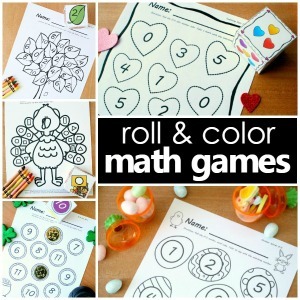 In this scenario, children can arrange and design and work as long as they wish. They can even leave the work space and return to it later. In a home or classroom with more than one child, this can encourage the idea of collaborative art, which is a fascinating way to watch children work together and create! In this setup, the “product” is not permanent but can be revisited repeatedly. 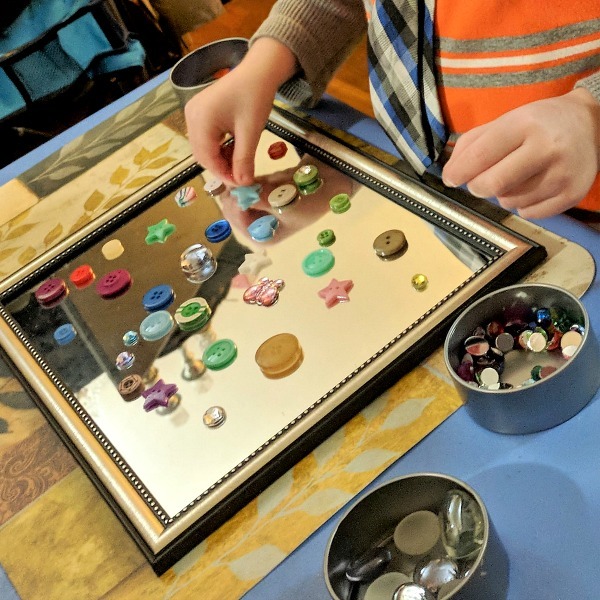 My older son spent a week repeatedly designing with frameless mirrors and a few small tins of buttons, glass gems and rhinestones on his art shelf. You can also encourage a more specific theme for creations as in this playful Monster Art Invitation. In the beginning, the idea of non-permanent art can be quite different for artists of all ages. Loose parts play does not generally implement the use of glue or tape as that would inhibit further exploration with the materials. There are times, however, that an artist does want to create a more permanent work. I like to simply increase the space between materials and access to glue and tape. I keep our art center stocked with both, but I do not necessarily set out the glue alongside an art invitation with loose parts. One of my personal pet peeves is waste in the art center. This is an area I have had to truly work on in myself. Some artists are genuinely done after a small design in the middle of a big white page. Some artists genuinely do churn out 37 projects in a day. All artists can learn to be mindful of caring for materials so that they last for a long time and intentional setups can encourage children to access, use and return materials properly. I like to keep my shelves well stocked but not overflowing. I also love to provide a collection of recycled containers and sushi trays for small loose parts to be easily transferred to the table for collage; think of it as portion control. A question like “what would like to do with this now?” almost always works better than stating that something does not look finished or needs an addition. Another way to encourage resourcefulness with materials is to model their value. My favorite way to do this is with the items collected in our recycling bin. In my home and my classrooms, one of our favorite activities of all time is when I set out an invitation to create with recycled materials. I am always amazed and impressed with what the children create and new life is given to items that would otherwise be thrown away! Incorporating loose parts into more “traditional” art activities is a great way to add that third dimension. I love the way this Planting a Button Rainbow from Inspired by Play combines drawing with loose parts! Combining three dimensional materials takes artistic exploration with loose parts to a new level. This is one reason I love clay so much! It is a forgiving material that can be worked and reworked–a particularly beneficial factor to young artists who may get frustrated by errors with drawing or painting. It takes time to work with clay and that inherently puts the emphasis on the process. You can introduce it on its own and gradually add in tools and loose parts. 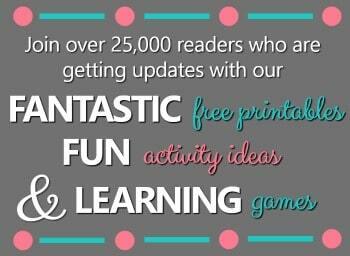 For more wonderful ideas, read “Clay: Don’t Forget the Explore Stage” at the Fairy Dust Teaching blog. By now we have combined the use of a variety of work spaces and small loose parts. We’ve added in some glue or tape and even three dimensional elements. 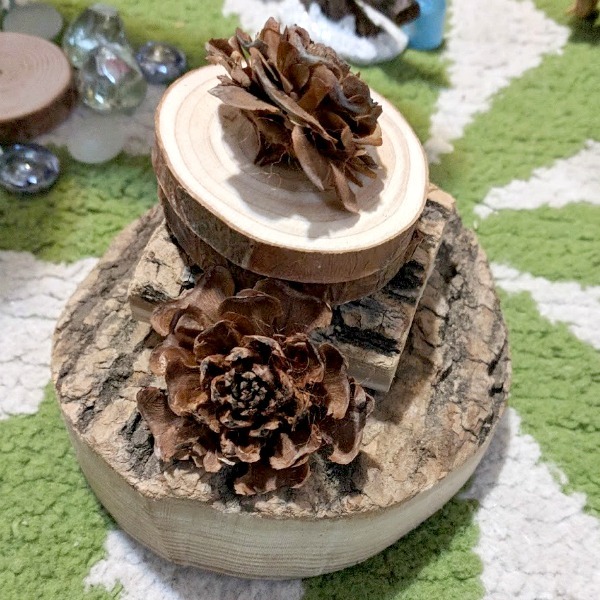 To take it up a notch, try out art with loose parts outdoors. Turn on the light table and explore the element of light. If you don’t have a light table, perhaps you’d like to explore art with the lights turn off using glow sticks or with loose parts in black light. There are no rules! There are benefits to simply stepping back and allowing children to naturally explore or sitting in and exploring with them. Less is often more and it is generally easier to add something in than to remove something from the scene. I have also found that if something additional is needed, children will ask for it or get it themselves! One area that I grapple with is whether and where to place my own writing of a name or caption on children’s art. I love using sticky notes for this so that my artists’ work is truly their own. Sometimes children will ask an adult to add, draw or otherwise contribute something to their work. I say, go with your instinct. Collaborative work even with mixed ages and levels can be fun! At other times, adult “examples” can lead to frustration or inhibit young artists. To Continue Play or Put Away? As I wrap up this post and series on loose parts play, I want to touch upon a frequently asked question in the world of loose parts play. Do you clean up after you play or leave out items in use? This particularly applies to the world of art as we see how intentional children’s creations are with loose parts. I do not have an easy answer One option is to offer a camera to preserve a memory. Children can even be given access to a camera for this purpose and capture their own photos! If you have a space conducive to leaving something set up for later, you can do so and put it away when a child truly refrains from returning to it. As an adult, I never thought I had an eye for aesthetics or design. I have learned so much by watching they way that children explore aesthetics and design through loose parts play. It is my hope and my belief that an environment rich in these open ended play opportunities will nurture children’s sense of curiosity and creativity as they grow. It might just reignite our own sense of wonder as well!